Picture of the day is of the grave of William H. C. Hoppers. He served as a private in Company H, 2nd Battalion North Carolina Infantry. 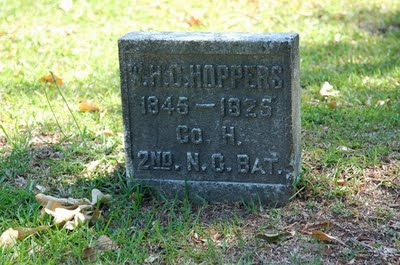 Hoppers is buried in the Confederate Cemetery in Marietta, Georgia. Labels: 2nd Batt., NC Inf. There are undoubtedly numerous Tar Heel – Confederate soldiers buried in the cemetery in Ashland, Virginia. Many of the dead from the May 1862 battle of Hanover, including members of the 7th NCST, 18th NCST, 28th NCT, 33rd NCT, and 37th NCT were most likely re-interred here after the war. 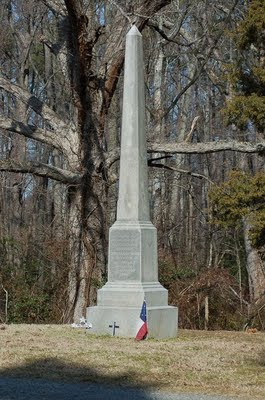 This monument marks the graves of four hundred Confederate soldiers and was erected by the ladies of the Ashland Memorial Association in 1888. My week of cramming is taking its toll, not only on my blogging, but also in many, many other areas. So, I thought I would post a few pics from some of my many cemetery crawls. This is a photo of the grave of Stephen M. Collis, Walker’s Battalion, Thomas’s Legion. 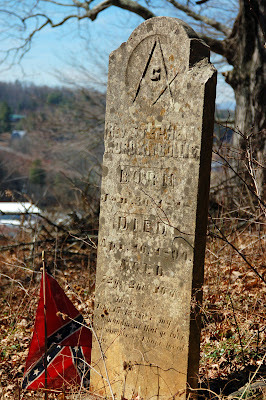 He is buried in a cemetery overlooking the town of Bakersville, Mitchell County. Recently saw that Josh Howard had written an essay on John Brown’s Raid and that it has been published on North Carolina’s Civil War Sesquicentennial Web site. I’ve known Josh since he was an undergrad at Appalachian State. Check it out here and tell me what you think – I’ve not had a chance. Crunch time around here. Crunch week for the 58th NCT. I plan to have it in the mail by Friday. I have finished the maps and the map captions. There are sixteen maps in the book. I have maybe ten or twelve more photographs to write captions for, which will give me about 100 images for the book. The whole word count is about 131,000. I need to go back through the manuscript one more time this week, make corrections, and add a few things that have come to light since I finished a few weeks ago. On to other personal notes. My book on the 37th NCT is now officially out-of-print in hardback. It is being re-released in paperback next month. More details will follow. Also, Remembering North Carolina’s Confederates is also on back order. I only have a couple ofcopies floating around. I’ll have an announcement soon on what is coming next (besides rebuilding my shed, which I’ve needed to do all summer). Not much going on in the news this week relating to North Carolina and the War. I did find this item of interest. Recently, divers found the remains of a couple of Blockade Runners in the Hillsborough River near Tampa, Florida. Having grown up re-enacting in the Sunshine State, I often like to take note of events related to the war years. So what does this have to do with North Carolina and the war? One of those recently found blockade runners was a 124-foot oak and pine steamer named the Scottish Chief. It is thought that this vessel was built in North Carolina in 1855. During the war, the vessel carried cotton and beef hides to Cuba, and returned with ammunition, wine, and maybe a cigar ortwo to Florida. The Scottish Chief and another blockade runner, the Katie Dale, were damaged and later sunk during a Union raid in October 1863. The Katie Dale has also been found, along with a barge. Once again, just one of those small pieces of the war. There are numerous articles on the Scottish Chief and the Katie Dale all over the internet. Check a few of them out. On a different note, I’ll be attending the Banner Elk Heritage Festival tomorrow. The festival is held at the Banner House, built by a Union soldier in 1865. Stop by and say hi. Sad day. I learned this morning that Sanna Gaffney passed away last week. Most you probably never met Sanna – she was a local genealogist in Boone and someone that I talked with at length many times. She used to call with questions. Never said hello, or passed the pleasantries, just launched into her question. It often took me several seconds to catch up. I also just learned that Frances Casstevens, the author of books on Clingman’s brigade and the 28th NCT, among others, passed away last night in Winston-Salem. I only met Frances once, even though we often swapped emails. I sent her some of my research on the 28th NCT. Has anyone else noticed that we are losing our Civil War historians rapidly these days? John Brown, pt. 3, cont. It’s probably time to continue with our look at John Brown. We’ve looked at the way two different North Carolina newspapers covered the Raid. Let’s look at the way that others within the state reacted. One further result of John Brown’s Raid was the reorganization of the state’s militia. I also think that this deserves a separate post, but we will hit the basics. North Carolina has had a militia system since the 1600s. At times, the system worked, and at other times, it did not. In the 1850s, each county had a militia regiment, and the state had brigades and divisions. The militia was required to drill once a year, but the system was largely defunct (even that is a generous statement). There was a large public outcry regarding the reorganization of the militia following John Brown’s Raid. While the state did act, it was slow. In some places, such as Mecklenburg County, and in Wilmington, volunteer militia companies were organized. Some of these volunteer companies became the first companies to enlist in state service following Governor Ellis’s call for troops. Let’s look at another newspaper, the Fayetteville Observer. On October 20, the Observer ran a piece on the Raid on page 3, their first page being made up of advertisements, and their second page a piece on Kings Mountain and Blackbeard… The Observer’s coverage lasted almost two columns. Their headline is “Startling News from Virginia,” and interestingly enough, at first the author believes that the Raid was a riot of workers at the Arsenal. They are not (at least yet) attacking anyone like the Weekly Standard did. The next issue was published on October 24, and much of the paper is devoted to the Raid. On page two, E. J. Hale, the editor, sums of the Raid from accounts from other newspapers. Interestingly enough, Hale looks at reports in Northern newspapers for how they reacted to Brown’s Raid. Hale found several neutral – the Journal of Commerce, Democratic, the Express, Whig, and the Day Book, all published in New York. The “incendiary” Evening Post apparently justified the actions of Brown. Beside the natural effect of deterring others from following an example where only disgrace and death are the rewards of the conspirator, where the State and Nation instantly unite their powers to punish them, and where there is an almost universal expression of abhorrence and detestation of their crime—another good result is manifest, in the clear line of separation which it has been made between the handful of Abolitionists and the great host of Republicans. That line had been almost obliterated—we in the South have been accustomed to consider it entirely obliterated. To see that it is not so, but only to read the conspiracy. With the exception of such fanatics as Greely of the Tribune and Bryant of the Evening Post, there is one united and overwhelming burst of condemnation. And while this ought to lead, and doubtless will lead, to a more kindly spirit between the sections, since it shows that after all we are not so widely separated as had been feared, it will be a death blow to the Presidential aspirations of such ultraists as Seward, and Chase, whose speeches have encouraged outrages like this at Harper’s Ferry. The outbreak has come in good time to prevent the Republicans from nominating any man of their stamp. The next issue, published on October 31, took excerpts from other newspapers to further inform their readers of the events that had transpired. These excerpts take about two columns of page two and are the only mentions of the Raid in that issue, although the Observer does make some mention of letters passed between abolitionists. I was hoping to get to ASU to look up some additional sources on North Carolina’s reaction to John Brown’s raid. But with time constraints, and with the flu running rampant on college campuses, I’ve decided to just use the resources that I have at hand. I will start by saying that using newspapers to gauge the public’s reaction to an event is not necessarily good history. Newspaper editors (then and now) are biased, and use their column space to present a certain view (theirs) to the public. With that warning in mind, let’s dive in. The whole country has been startled by the insurrectionary movement at Harper’s Ferry, Virginia, full accounts of which will be found in our paper today. The movement was promptly suppressed by the authorities, but it will be long remembered as a [practical] illustration of abolition doctrines. The President of the United States deserves the thanks of every true man North and South, for the energy and promptitude which he displayed on the occasion. What would have been done, if Seward had been President? Everything else on the first page is a reprint from a newspaper in Washington, D. C., detailing the raid, and the search for fugitives. Holden devotes most of page three (the newspaper was only four pages) to coverage of the Raid. He continues his own thoughts, praising the actions of Virginia Gov. Henry A. Wise. Holden then looks to identify the financial backers of the Raid, naming “Gerritt Smith, Joshua R. Giddings, and other prominent abolitionist.” Holden wanted the federal authorities to “take hold of these men…” He also wrote that “If about one thousand of the prominent abolitionists could be hanged by the neck until they were dead, the country would be benefitted, and all good men every where would be more assured of a continence of concord between the States.” Holden’s next paragraph is aimed at Seward and the abolition movement. “At the North this Harper’s Ferry movement” Holden writes “should produce more sound reflection on the subject of slavery than heretofore, and should dispose every just and fair-minded citizen to set his face against a party whose doctrines lead inevitably to insurrection and a dissolution of the Union.” Holden then goes on to reprint articles from Richmond and Baltimore. In the next issue of the Weekly Standard, published on November 2, 1859, Holden once again turns his pen against Seward. On page 1, under the title of “The ‘Irrepressible Conflict’”, Holden writes that the “doctrines announced by Mr. Seward, in his Rochester speech, have displayed their first fruits in the recent outbreak at Harper’s Ferry." The editor then looks at the doctrines of the “black Republicans,” and latter takes issue with Republican journalists, saying that while they “seek to palliate the wickedness of old Brown and his confederates, by declaring that he is a madman, and that they are not responsible for his conduct…” Brown’s actions “are the legitimate fruits of their doctrines, which teach that slavery is a monstrous evil, to be ‘extirpated’ by every means under the ‘higher law’ which its enemies can command." Greetings folks! I was away at a Avery County Heritage Museum meeting this afternoon, and found this in my email on my return. The North Carolina Museum of History has returned a Civil War flag of Company L, First Rhode Island Cavalry to its home state. The V-shaped flag, called a guidon, was captured by the 63rd North Carolina Troops (Fifth North Carolina Cavalry) on June 17, 1863, during the Battle of Middleburg, Virginia. The battle was part of the Gettysburg campaign, a series of battles in June to July during Confederate Gen. Robert E. Lee's movement through Virginia toward Pennsylvania. The silk, striped guidon of Company L, with stars and letters on a field of blue, was donated to the Museum of History in the early 1900s. The gold-fringed banner has been fully restored by the museum and has appeared in previous exhibits. In a gesture of goodwill, the Museum of History initiated the offer to return the flag to the State of Rhode Island. In 2008 the Rhode Island National Guard accepted the gift from North Carolina. "The Rhode Island National Guard is thankful to the North Carolina Museum of History staff for graciously returning a Rhode Island Civil War guidon," says Maj. Gen. Robert T. Bray, Adjutant General and Commanding General of the Rhode Island National Guard. "We are delighted to display the banner, especially given its pristine condition as a result of the careful preservation provided by the museum, among the many historical artifacts at the Varnum Armory in East Greenwich." The Museum of History hopes the State of Rhode Island will return a North Carolina flag captured by Rhode Island soldiers at New Bern on March 14, 1862. "We would like this Confederate flag, along with ones held by other states, to eventually be returned to North Carolina," says Tom Belton, curator of military history. In addition to the Rhode Island guidon, the Museum of History has given back a Civil War flag to Louisiana. The banner was mistakenly identified as being associated with North Carolina. Within the last few years, the Museum of History has received North Carolina flags from Arkansas and Massachusetts to add to its collection. Company L, First Rhode Island Cavalry suffered devastating losses during the Battle of Middleburg. On June 17 Union Col. Alfred N. Duffié led more than 230 men into Middleburg around 4 p.m. After hearing of their arrival, Confederate Maj. Gen. J.E.B. Stuart ordered Brig. Gen. Beverly Robertson to move the Fifth North Carolina Cavalry in, and at 7 p.m. the regiment surrounded and attacked the Rhode Island unit. Several of Duffié's men were killed or wounded, and the rest were driven out of town and fought their way through the night. Most of Company L's soldiers were captured the next morning. Only four of Duffié's officers and 27 soldiers made it back to Centreville on June 18. A few more men from Company L returned during the next two days, but the regiment's losses were about 200. For more information, call 919-807-7900 or access ncmuseumofhistory.org. The Museum of History is located at 5 E. Edenton St., across from the State Capitol. Time for our little look around…. The blog North Carolina Miscellany has yet posted another post about Abe Lincoln’s North Carolina roots. Check it out here. The Chapel Hill News has an article that you can read here that is comparing our War in northeastern North Carolina in the 1860s with the war in Afghanistan. Hmm, I’m not so sure that I agree with their assessment. In the Examiner.com, there is an article looking at Gov. W. W. Holden, the only North Carolina governor to have been impeached. Check out the article here. The Sun News, out of Myrtle Beach, complains that the displays at the North Carolina Capital is not racially diverse. Hmm, I felt tthat there was plenty of diversity last time that I was there. Maybe they have changed things around. Check out the article here. Interesting article in the Washington Post (you can read it here) about the town of Beaufort. The Examiner.com (mentioned above) has a good article on the Bennett Place. Read it here. I’m going to put up a poll on the sidebar and keep it up for a week, and then we will talk about the results. Thanks for voting.